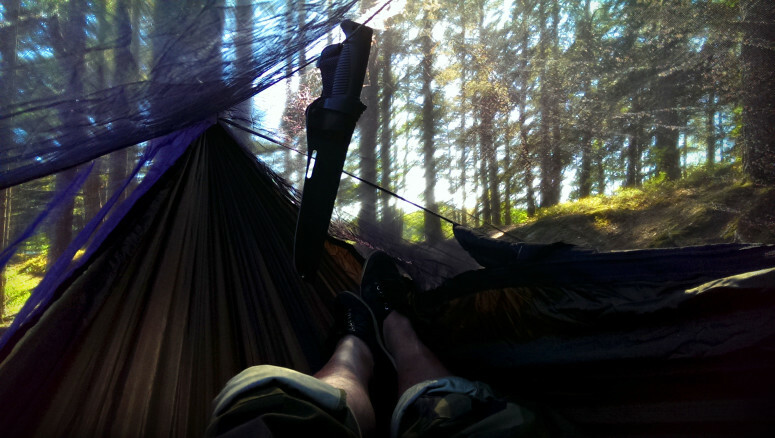 As an outdoorsman, or -woman, moving from sleeping on the ground to suspended in a hammock is one of the most revolutionary steps you can take. It really changes things quite dramatically. 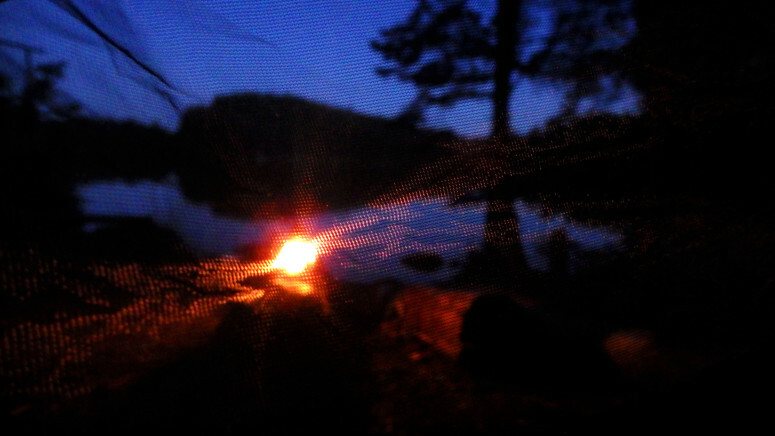 Many suffer from lack of sleep when camping, commonly due to feeling uncomfortable on hard ground. Sound and comfortable sleep is very important, and lack of it will quickly drain your energy, and at least detract from your experience of nature, with a dull brain causing you to lose attention to your surroundings. In worst case it can even be dangerous as it affects your judgement, increasing the risk of injury or getting lost. And here is the beauty of hammocks: They are very, very comfortable to lie in. So comfortable in fact, that some even sleep better in them, than in regular beds. Like for so many, my first hammock was at the lower end of the budget range, which although serviceable, was simplistic and lacking some of the finesse of more intricately designed alternatives. 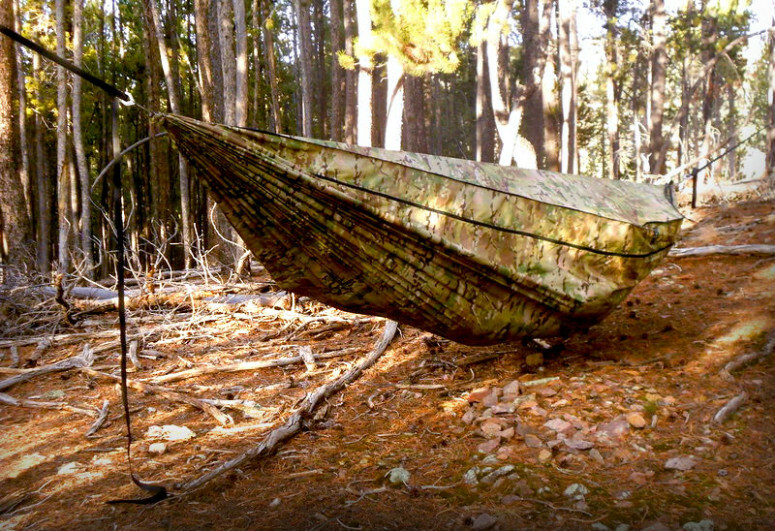 I had heard about Warbonnet hammocks, but was hesitant since I was uncertain if hammocks was something for me, something worth investing in. Today, I know, and can without hesitation recommend everyone to go straight for something like the Blackbird. 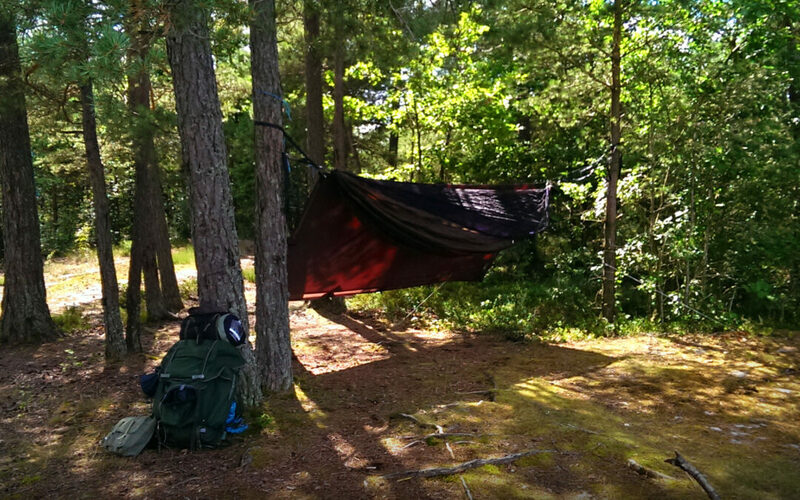 Simpler and cheaper alternatives will still suffice for occassional hammocking, but for anyone with a decidedly more long term interest in outdoors life, and those seeking really good comfort, there is no need to hesitate. It is simply brilliant. How? Well let me explain. But first of all, let’s look briefly at the data & features, after which we will go into more detail. 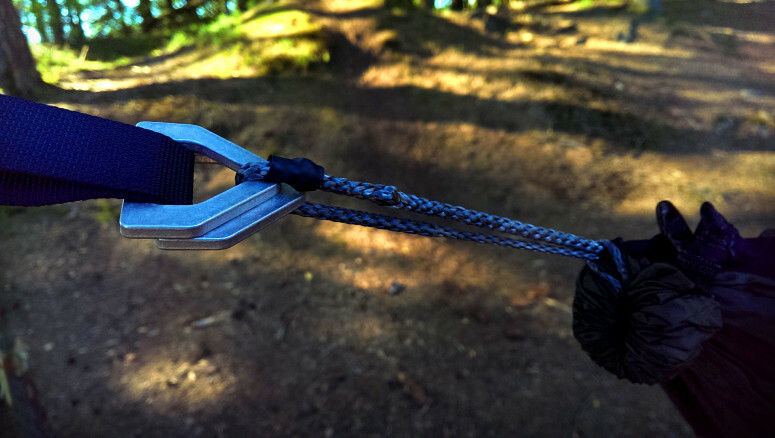 Currently, for this particular setup with double 1.7 layers and buckle webbing, the price is $210, not including tent pegs or carabiners. Warbonnet Outdoors has their workshop at the foothills of the Rocky Mountains in Colorado, USA and all their hammocks, tarps and quilts are sewn there. It’s a family-owned business that started out of their garage in Fort Collins, Colorado in 2008. This is in my experience a very good thing, as that means they are both very proud of their products and concerned about the company reputation at a personal level. And consequently, their hammocks have since then gotten quite popular with a solid reputation for quality and good design. 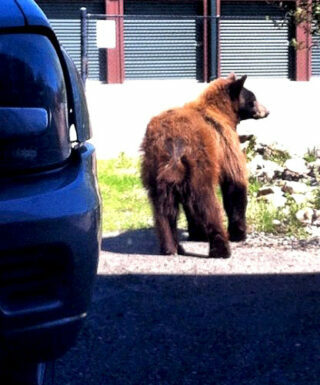 Today the company has a ‘handful of employees’, operating out of Evergreen, just west of Denver, Co. So with the basic data out of the way, let’s look at the options. The capacity range, combining different fabric and layer options, varies from 250lbs/114kg – 400lbs/181kg and depending on your choices the weight ranges from at least 1 lb. 9.5oz/0.723g to 2lb 7oz/1.1kg . You can choose from two different fabric weights; 1.1/30D or 1.7/70D. 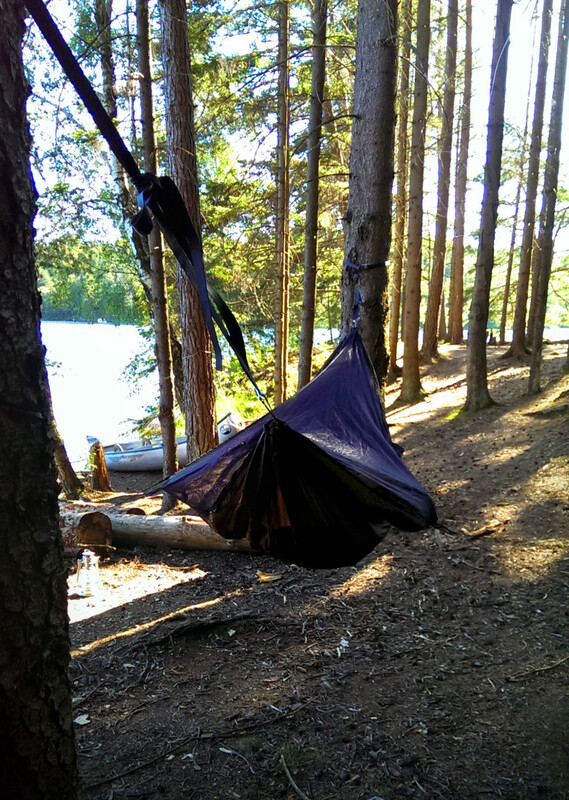 For this hammock it means a difference of 7oz/0.2kg in weight, and a 125lb/56kg difference in capacity. So, if you are well within the lower weight limit and if you are concerned about your ultra light equipment, then you can save a bit of weight here. On the other end, if you, like me, are a bit heavier or risk ending up with a child or a dog in your hammock, then you might want to consider the stronger, but slightly heavier alternative. You can also choose between single or double layers. With double layers you can store a sleeping mat inbetween the layers for more warmth. With the 1.7 fabric hammock this also means a difference of 10.2oz/0.29kg in weight, and a difference of 150lb/68kg in capacity, again, something to consider both for ultra light hikers as well as for heavier hammockers. The fabric comes in three different colours, depending on what weight you choose; olive green, olive brown and multicam. Another interesting option is the top cover that is designed primarily for winter use. It is the same fabric as the hammock and replaces the removable mosquito net. It catches about 15F / 8C of heat thus keeping you a little bit warmer. Note though that this has to be ordered with the hammock as it is individually adapted to your particular hammock. Also, it doesn’t replace a tarp as it is not waterproof. The suspension is what you use to fasten the hammock to trees with. 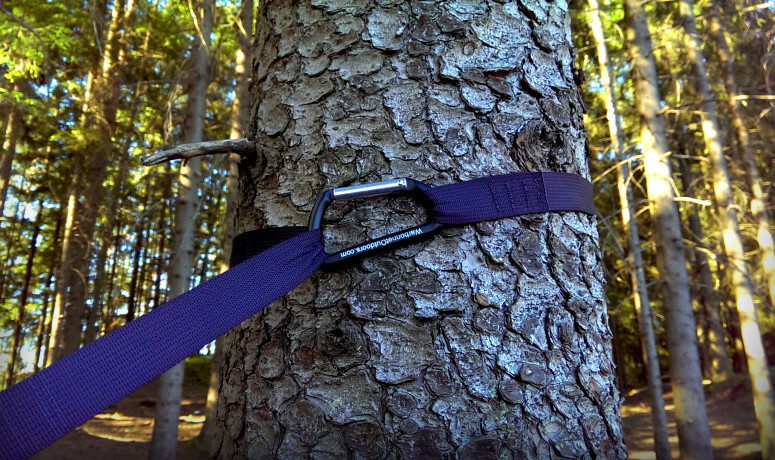 The ‘tree huggers‘, the straps used here are the same type that seatbelts are made from and are extremely strong and durable. You can have two different types of adjustments for it; buckles or whoopie slings. Both work very easy and make the adjustments of the hanging dead easy. Whoopies are 3oz / 85gr lighter. I absolutely love the simplicity in setting this hammock up with the suspension of my choice; carabiners, tree huggers and buckles. The hammock is set up in under 2 minutes. To set it up you simply remove the hammock from the included double-ended stuff sack, wrap the straps around the tree at about head or shoulder height and hook them around themselves using the carabiners. The hammock should be set up at a 30 degree angle for best comfort, but it is somewhat individual and some prefer an even flatter setup. The angle is easy to adjust using the replaceable buckles. Just pull on the loose strap to tighten it. Lift the hammock and separate the buckles to loosen. Dead simple. Make sure you can sit down in the hammock easily, so you can get in and out without any problems. Unlike cheaper alternatives, I have noticed no stretching in the webbing or fabric so I have awoken at the same height as I went to bed in. Worth mentioning is that the hammock has a left and right side, as well as a foot and head end, meaning you need to set it up with your desired view in mind. The zipper is on one side and the other has a storage shelf. 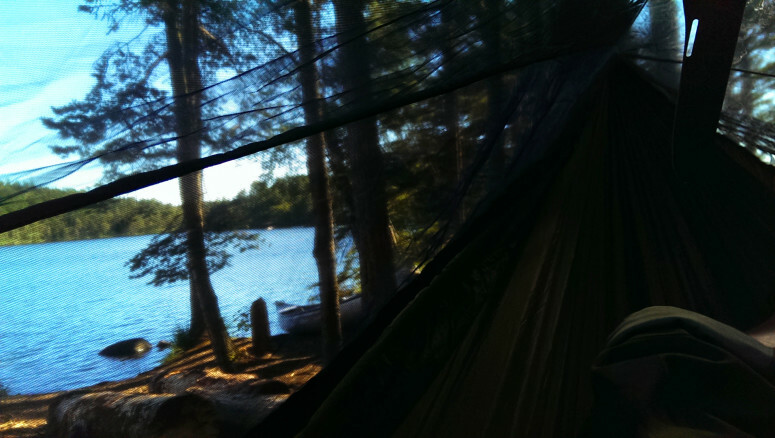 So check which direction your hammock is before hanging it from the trees. The zipper closes at the head end, as it should. I have had no real issues with it getting stuck, but being careful closing it is always wise. A tarp is of course also a good idea, not just for protection against rain, but also cold wind. For some it is also an added layer of comfort as it can add to a sense of security if you are used to camping with tent walls around you. Make sure to examine the trees where you plan to hang the hammock beforehand looking for dead branches high up that pose a risk of falling down on you. Taking things down is just as easy as setting it up and packing the Blackbird into the stuff stack, again, is very simple. You are ready to move on within minutes. Hammocks tend to be a bit cocoon-like in design, which can be perceived as a bit claustrophobic. The Blackbird excels even here though. 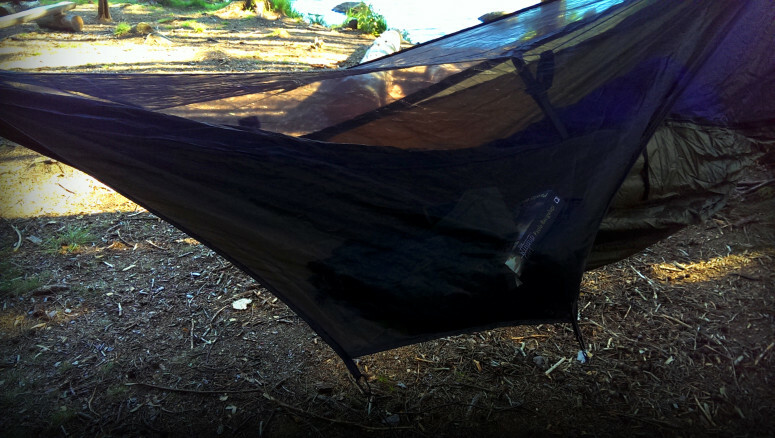 The integrated ridge line and the elastic side lines keep the removable mosquito net well expanded and pulled aside and the opaque sides down, meaning you have plenty of room once inside, and when lying diagonally you still have a very good view out of the hammock, which is a problem with some hammocks. This is a far better design than e.g. the DD Frontline where you have to insert two plastic rods into the mosquito net which is difficult and annoying, especially if you are in a hurry in bad weather. At night this is the kind of view you will have. 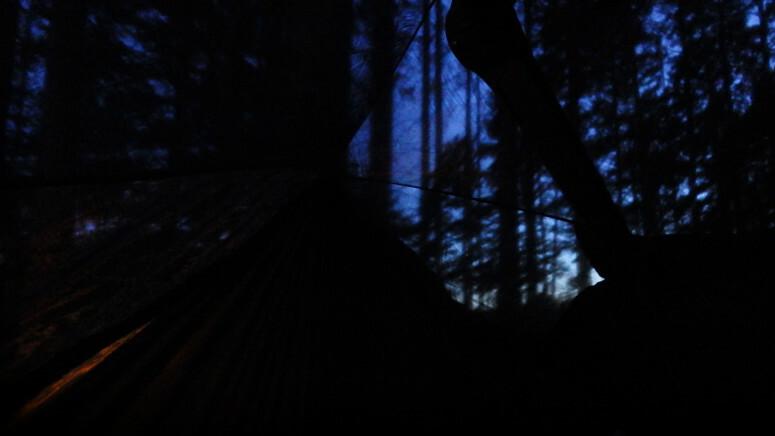 Watching the stars and moon come out at rain free nights while you lie comfortably on your back in the hammock, swinging gently in the light evening breeze, is a wonderful experience. Not only is the view at the foot end very good, but also at the head end. The side of the shelf gives little view out, but the other is a good height for looking out when lying down. Personally, I really like that since I both like to lie watching the sun set over the lakes, but also want to be able to see any wildlife or people approaching. The hammock is equipped with a quite generous storage shelf/pocket that lets you store things like a phone, book, flashlight, drinking water, extra insulation clothing etc. If you put a lot of things there, then make sure to use the elastic lines to pull it away from the hammock or else it will stick to your body as you lie in it. 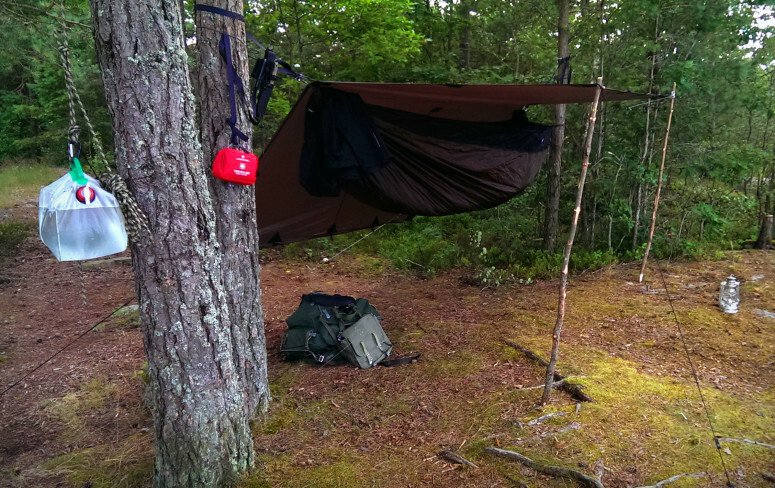 As can be seen in the picture below, the hammock has a ridge line from which you can hang a flashlight, your knife, a first aid kit etc. Properly set up the ridgle line is quite stiff when you lie down in the hammock, so your gear won’t slide up into your face. The comfort from the asymmetric design with footbox is wonderful, although I need to get rid of my mymmy bag to fully take advantage of the design. Properly set up, the footbox means you can lie diagonally, pretty much perfectly straight. Symmetric designs can make things feel cramped and tight, but with the side lines and the assymetric design I don’t get that feeling here. The aforementioned good view also helps with this. Lying on your back, on the side extended or in foetal position is no problem at all. Sleeping on my belly isn’t quite working yet though, but also not something I really seek in a hammock. Two layers of fabric means you can put a sleeping mat underneath for better insulation and slightly more rigidity, but a proper underquilt is adviceable for colder weather. All hammocks suffer from this same issue; your back gets colder than when sleeping on the ground, as there is no material capable of trapping warm air beneath you. As you lie down, all fabric is compressed tight underneath you and it gets cold. Sometimes really cold. So, make sure to bring a sleeping mat or an underquilt with you, or you will risk freezing through the night. Besides the great comfort of hammocks, they also have another great advantage; ease of setting up. Not only are they quick to set up, in under 2 minutes, but they also just require two good trees to hang it from. The trees don’t even have to be very thick and surprisingly small trees will suffice. Some even use rocks, or a single crooked tree. This means you don’t have to search for that flat, even ground with a hammock, which is a great relief and enables you to camp in places that are difficult or even impossible with a tent, even smaller tents. The tarp takes a bit of consideration though, but usually rests on a line tied between the same two trees. It just needs a bit of space to the sides to provide proper cover. So having now tried the Blackbird XLC on several trips I can comfortably say that this is an excellent hammock that is of greatest quality and design. The features are clever and practical and the attention to detail excellent. Setup, comfort and view out of it leaves nothing to be desired as it all works just perfectly. Just remember to get a couple of carabiners and a few tent pegs for the sidelines as they are optional. I will return with a follow-up review later on, trying it with quilts in colder temperature and hopefully with a wider sleeping bag that allows for more comfortable sleeping than the mummy-style bag I am currently using. Until then, enjoy nature and hammocking y’all.